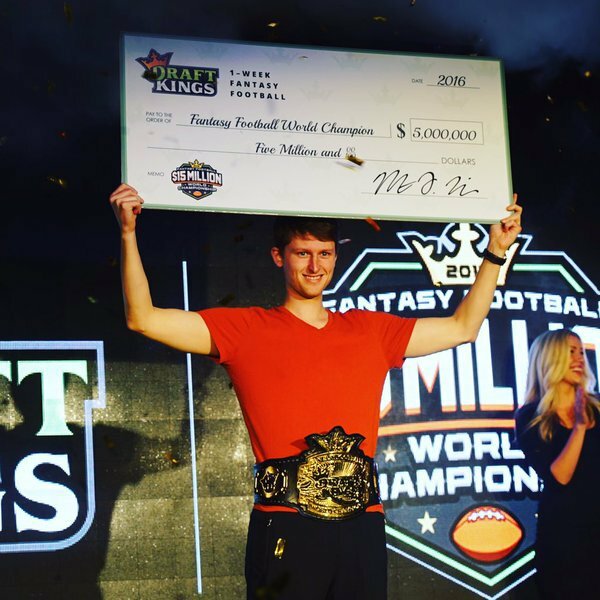 On Sunday, DraftKings wrapped up the NFL season of their daily fantasy sports slate with the $15 Million Fantasy Football World Championship contest. In the end, it was poker pro Aaron Jones who came out on top, earning the $5 million first-place prize and a championship belt. The contest gathered qualifiers for the first 14 weeks of the NFL season. The top 200 players then made their way to Las Vegas for the semifinals. Those players all earned a guaranteed $20,000 payday, but the top 10 players advanced to the final round to play for a minimum of six figures. Jones sat in fifth place overall heading into the final round, but was able to overtake the top spot thanks to big performances from Arizona’s Larry Fitzgerald and Pittsburgh’s Martavis Bryant to secure the win. Jones had plenty of support in his corner in the form of other poker pros and top DFS professionals such as Assani Fisher, Dan Smith and Steven Silverman. I recommend winning $5m if you guys have a chance. It was fun and I would do it again. After becoming a professional poker player at 17, Jones owned and operated training site Leggo Poker before selling it to Phil Ivey in 2013. Since then, he’s spent the majority of his time grinding DFS and is currently ranked 50th in the world according to Rotogrinders.com. The DFS industry was dealt a blow in October when the state of Nevada ruled that operators must obtain sports betting licenses to offer contests. DraftKings and FanDuel, which control 90 percent of the DFS market, insist that their product is a skill-based game and therefore does not constitute gambling. The sites are continuing to do business in New York while awaiting a May appointment in the state Supreme Court. New York’s legislature is also currently considering regulating fantasy sports, which would likely end the legal battle between the sites and the state’s attorney general.